Wasn’t it nice of the Olympic Committee to celebrate my first retirement week at home with such an extravaganza. A wonderful show although I hope Equity exempted HM from joining the Actor’s Union! How come there are 204 nations competing and only 196 nations in the world? OK so we are still in July and are still in the IoM but an early morning visit from post lady means we get our passports back from getting Vietnam Visas (for later in year) and I can spend some time booking our return from Jersey via France rather than straight back to IoM. 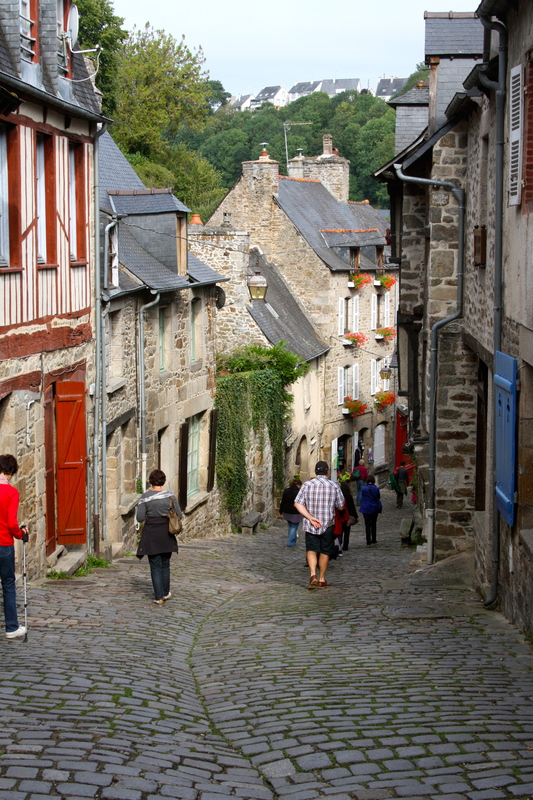 Book a hotel for a night in Dinan that we haven’t stayed at since our Jersey living days so hope it is still as good as it was. 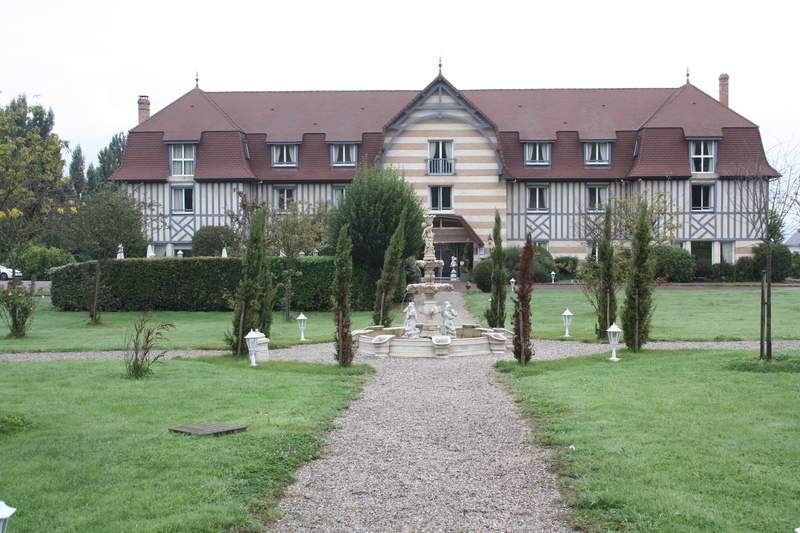 Will leave booking other France hotels and ferry back from France to UK until later – plenty of room and we are now flexible! Oh how the tables have turned, Flic up and out to work leaving us in bed. Manage to get to House of Fraser to spend our 2 £10 vouchers and then drive to Coleford to meet up with Rob ( our caretaker for Dingle Rise ) and call in at an estate agent who advises that rental market not great at the moment but it could yield us c£650 PCM. On to Phillip & Sylvia for two nights with them and an assortment of their grandchildren but no mobile connectivity. Win Pictonary which is a surprise as I can’t draw. Not an inspiring day so watch some of the Olympics on Tv and help Andrea with some holiday choices with meal out at local pub. Some mobile phones, I learn, can hold 3 sim cards which helps roaming! Walk through fields in break from usual summer rain in weather in afternoon. Drive to Poole uneventful and brings back memories of travel back to Jersey 12+ years ago. Crossing not exactly smooth but boat quite empty so locate near back with no one around us who might be sick. 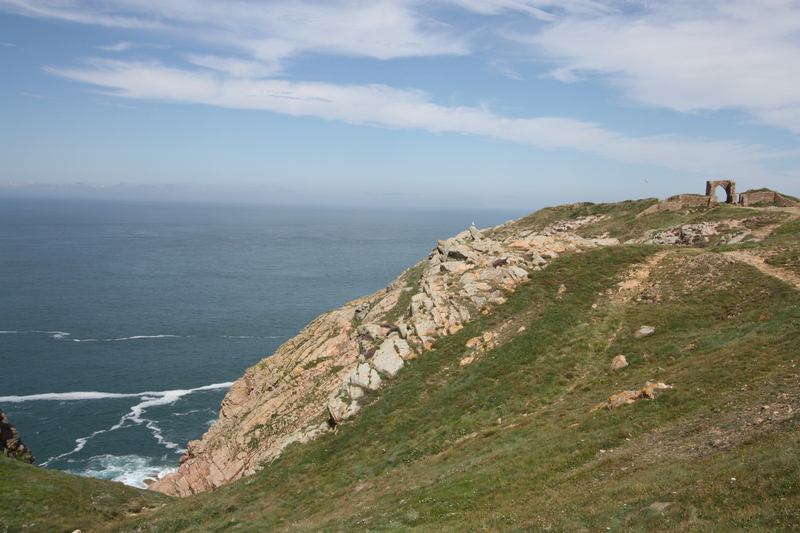 Leave 20 minutes early – unheard of for Condor ferries! Managed to get to see Harry before he went to bed then off to the Raddison Blu as Mel was at Sarah & Ali’s. 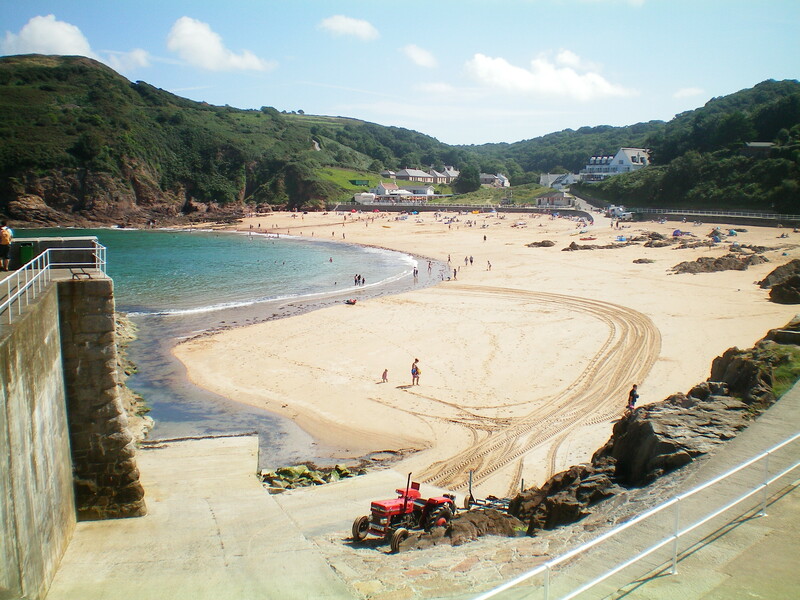 Took Harry to Greve de Lecq after nursery. 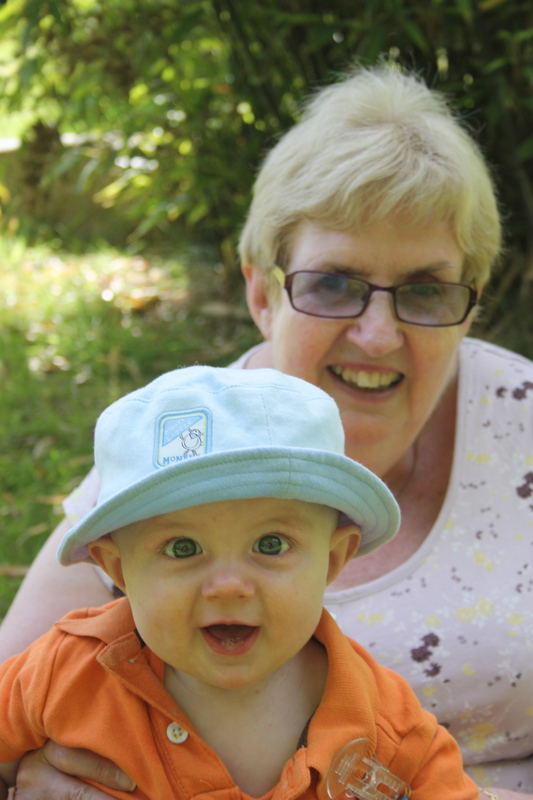 Harry can walk with someone holding onto his hands – amazing for someone not even 6 months old. Took him down to the sea and he managed a paddle. Lovely Key Lime Pie ice cream – yum! Off to Milbrook park for a play on the kiddies things. Mel took him on the slide and a swing. Evening meal with Jim, Laura and Kevin at Ad Lib restaurant. Pouring with rain when we left. An indifferent day but went to Ransoms garden centre for lunch which was surprisingly not crowded. Harry fell asleep whilst being pushed around. Very heavy rain shower after we got back to the hotel which probably was not appreciated by the sand racers on St Aubins beach. Fantastic day at the Olympics – 6 GB gold medals. Mel’s friend Debbie was at the stadium which must have been a fantastic experience, very envious. Went to Holme grown garden centre’s cafe – good food and no trouble from the pesky seagull. 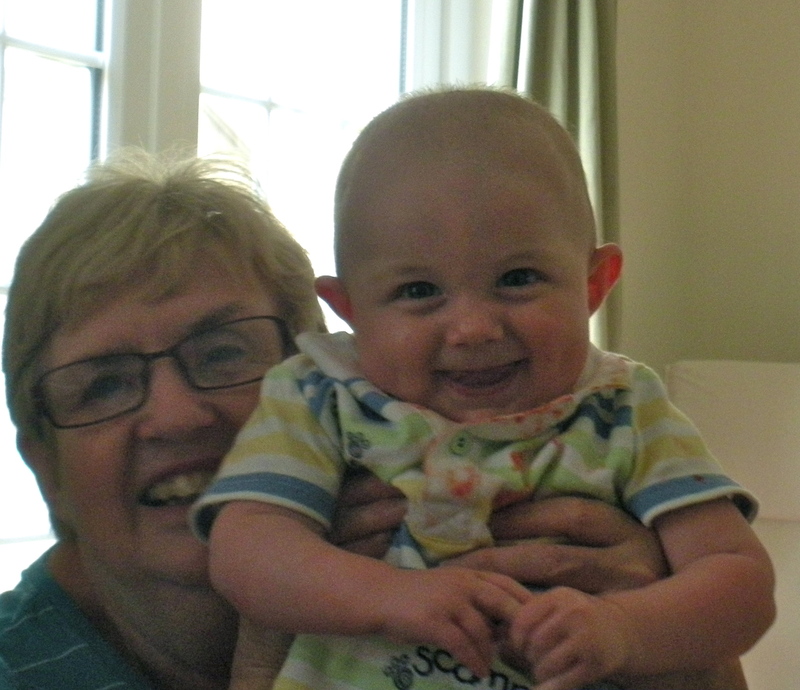 Took Mel to airport for her journey home – she was sad to leave Harry. Morning in town then off to fetch Harry from Nursery. Back to Greve de Lecq but no ices this time. Harry not impressed with paddling in stream water though. Last morning at Radisson Blu and Harry delivered to us by Ali at 8am. Walk around harbour doesn’t send him to sleep as he is too interested in what is going on around him so go to breakfast and he is a hit with some of the waiting staff. Clear room and now at Sarah and Ali’s until Saturday. 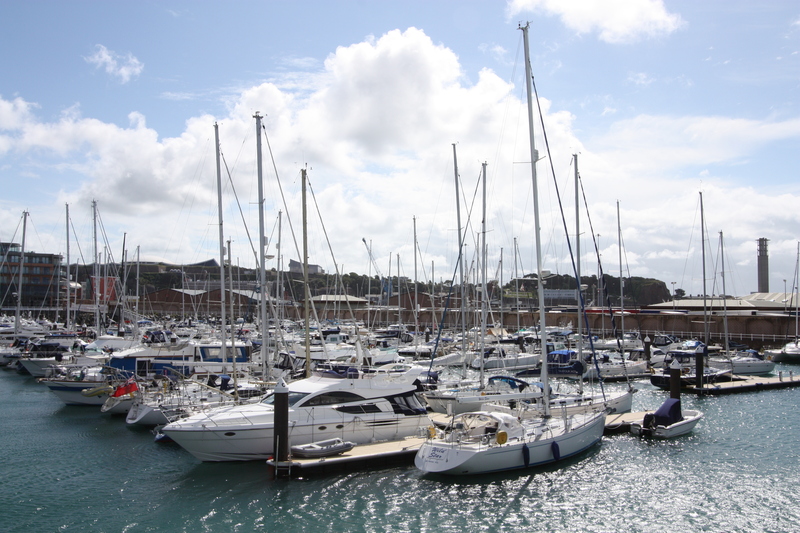 There is so much money floating in the harbour not being used by so many wealthy people – what a life they must lead. What a lot of money – this is only a fraction of what lies in the water! Walk to Five Oaks and realise that Jersey pavements are not particularly push chair friendly. Dinner at Portlet with Peter and Pam (home stay biker) who are off to St Malo tomorrow although Pam is not a good sailor. It is just incredible how many gold medals we have in the Olympics with 4 more today. Shorts weather day. Completely mis judge parking in town and end up with not enough time. Harry has dietician appointment so meet Sarah at hospital. Harry ok and likes the paddling pool afterwards. Spend evening with “Bugger all to do club”. Battle of Flowers day so best to avoid town. Zoo is good option but Harry doesn’t manage to see much as it is too hot. 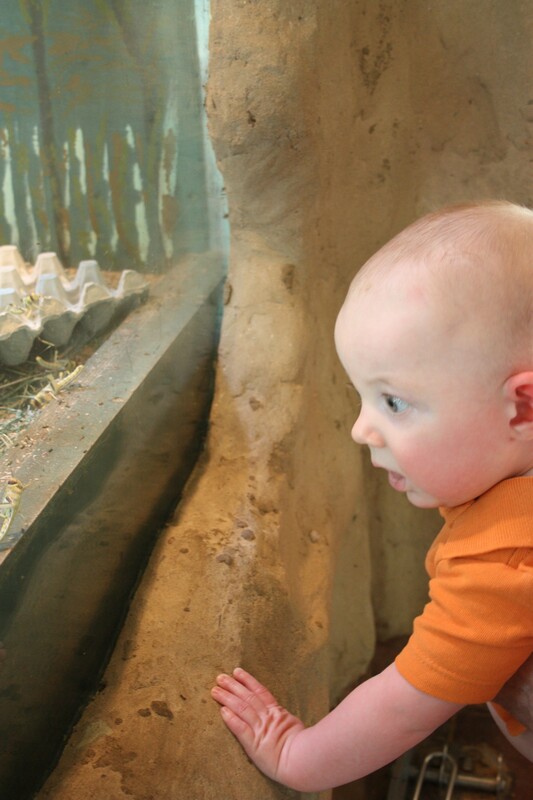 He likes the locusts by the meerkats though but hated the changing mat in the cafe. Catch up with Brenda, owner of the cafe who we know from our time living here. Called “elderly gentleman” by boy on counter when sorting out membership – how rude! (But Brenda said he had a brain the size of a gnat. I can’t believe I queued for over 20 minutes to buy tickets for tonight’s Battle of Flowers evening parade. No on-line booking facilities and their card machine was not working properly! Too hot to go to beach so a paddling pool afternoon. Evening parade is watched at a house on The Avenue 100yds from where we used to live! Deja Vu big time. ( one of Sarah’s colleagues lives there ). Get talking to a South African also there who has been in the island for 11 years and is a lawyer in the Patent industry and who knows David Bester and the Haas brothers – small world – from a potential business arrangement. 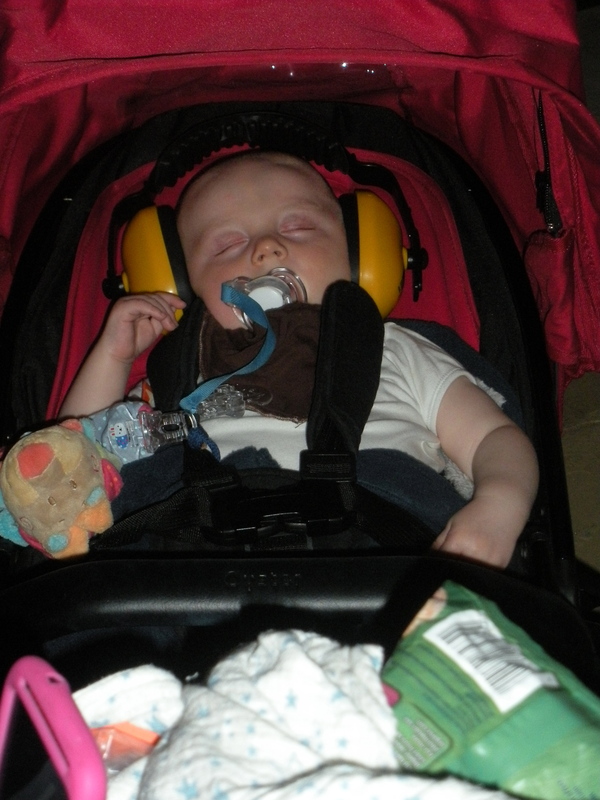 Harry didn’t like all the noise from the floats so the ear defenders were a good idea and the bonus was that he slept through to 7am the following morning. Move to self catering bungalow for 3 weeks. Small and a bit old fashioned in furniture but with no washing machine or cafetier so borrow cafetier from Sarah and will do washing at Sarah’s. Out to dinner with Laura & Jim at the Seacrest at Gorey. Not a good impression on the decor – a bit touristy – but food good at £30 per head. Very hot day and no Harry to look after. 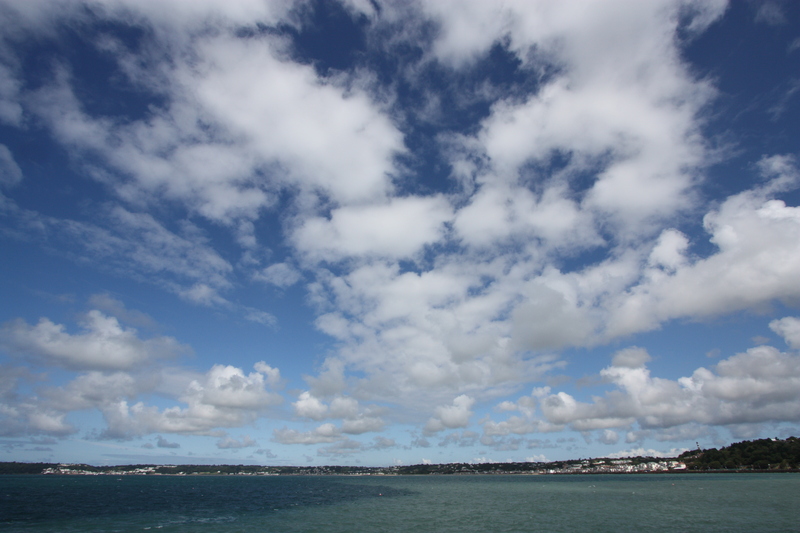 Walk at Gorey for an hour, otherwise a lazy day. Watched excellent Olympics closing ceremony and marvelled in the re-run of all the gold medals won. Team GB did us proud and I am so disappointed that we were not able to go to any of the events – but we do have Harry. Woke up at 09:10! Collected Harry from Nursery and he fell asleep almost immediately whilst we drove back to Sarah’s. His smiles are infectious – magical. Early start today to arrive for babysitting duties at 07:45! Take Harry to Boots for a photo shoot and have to change his clothes whilst waiting in the queue; he was such a good boy and the photos we see on screen look good. Woke early to a rain and thunder storm, haven’t heard thunder for a long time. Enter my fantasy teams for Trident, RBS Audit and the BATD Club but don ‘t know the PIN for BATD. Jim cooks a couple of good curries at BATD, Kevin tells his Olympic stories. Bob Le Brocq ( back for A level results from a holiday in Spain) has put on a lot of weight and it appears his daughter Sarah has as well although she is entered into the Jersey triathlon in September having lost 6 stone this year! Woke early again – curtains too thin which let in morning sun! Watch ( which I dropped on Sarah’s hard living room floor about a week ago ) will cost £345 to repair so take it elsewhere for 2nd opinion as not sure it is worth it. Called in at St Peters garden centre for coffee with Peter and Pam en route to airport – bad move as centre now has ladies clothes. Eventually go there three times today! Lunch at Portlet with Ali &Toby. Took I-pad to Sarah’s for her friend Keiran ( a computer expert ) to find out why we can’t get e-mails. He can’t help so it is back to Manx Telecom. Took Harry to beach at St Ouen’s. Walked away from car after lunch only to be met with “Richard?”. Took me a few seconds to realise who it was – Jayne Bizec from Coutts who I hadn’t seen for 12 years. How did she recognise me in my sun glasses? Lunch in park at St Helier church. BBQ with Harmony men at Clive Chaplin’s house. How was I able to remember the words and internation to three songs after not singing them for 12 + years? Wonderful evening that brought back many memories of my time with the Harmony Men. Fog! I had forgotten how bad it could be with the whole island covered and airport not able to receive papers until mid day. Walked on St Brelade’s and Ouisene beach at mid day. Dinner at Portlet to use £35 worth of vouchers. Miserable family on adjacent table never talked with the man giving regular disapproving glances to our table as he obviously didn’t like Harry being there and eating off the table. 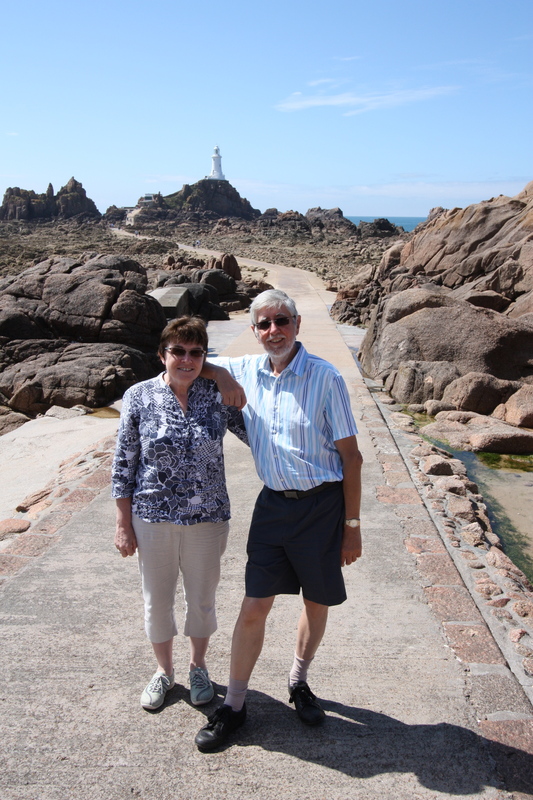 Then off to Corbiere and the famous lighthouse. Collected Harry before 8am on my own and then after breakfast we all took him to St Catherine’s for a walk by the breakwater. Can’t believe cafe does not serve cappacino but does serve absolutely crappy coffee. Not to be recommended for a return visit. Afternoon with Harry at St Aubins consuming a very large ice cream avoiding the seagulls! Curry take away from New Raj – still as good as it ever was. Hope John & Deirdre enjoyed their stay, we took them back to airport and Sally went and bought more tops at the St Peters GC at a ridiculously low price in their sale. Looked at Harry photos at Boots – very good and Sarah is buying a CD with them all on. Dinner at Ransom’s GC with Laura & Jim and the off to the BATD club at the Royal. 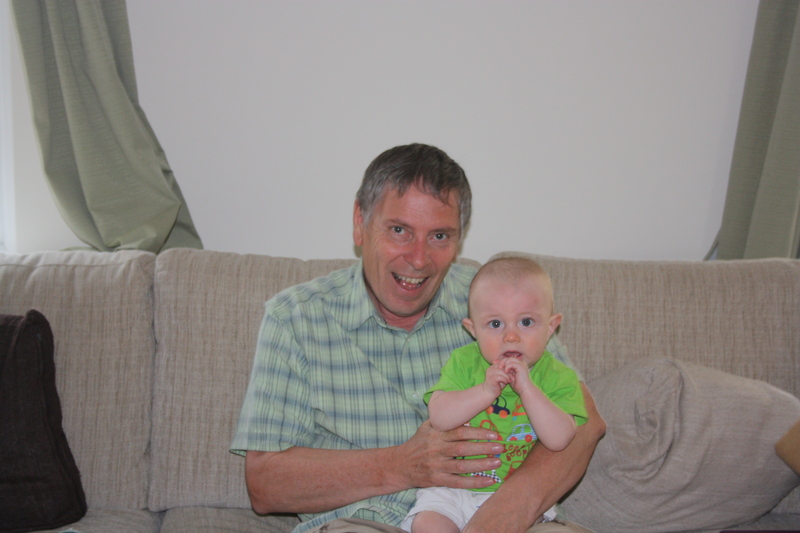 Weather taking a turn for the worse and just miss large showers so play-time with Harry indoors. I go back to IOM this afternoon. Wet in Jersey, dull in Oxford and in IOM. Lots of post to look at but the three e-mails we had received headed “News about your (Lottery) ticket” revealed under £20 between 3 wins. Rehearsals go well and Tesco visit after 11pm saw more containers of food etc than customers. Missed big storm that Sal had in Jersey last night. Wet day so good to watch the ‘orns beat Birmingham City live on Sky. Good enough to mow lawn but manage to cut through cable so visit to B & Q to get an adapter to join the two ends. Cheaper than a new mower though but a scary moment. Rehearsals that I came back for cancelled!!!!!!!! Computer crashes 3 times whilst on Google Maps so that might have to be replaced. £68 single to Jersey with Flybe a good bargain. Back only slightly late with lunch at Goose on the Green. 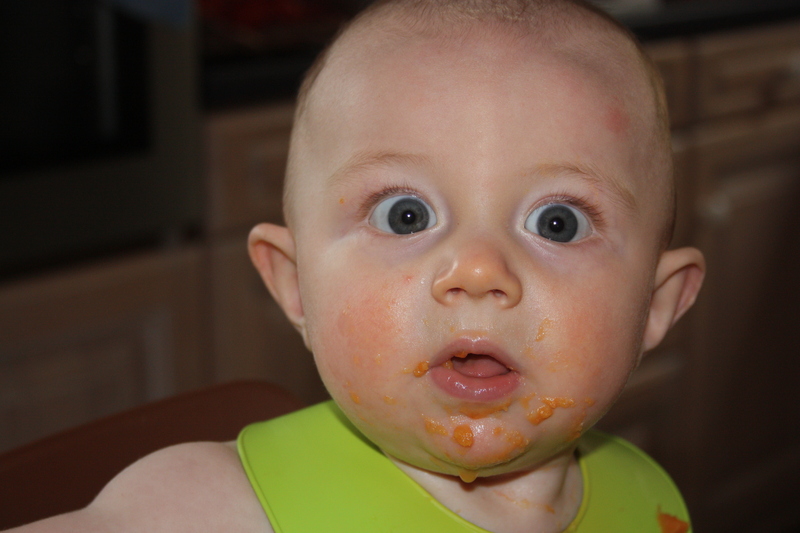 Back on Harry duty all day but he is a bit grumpy, teething? 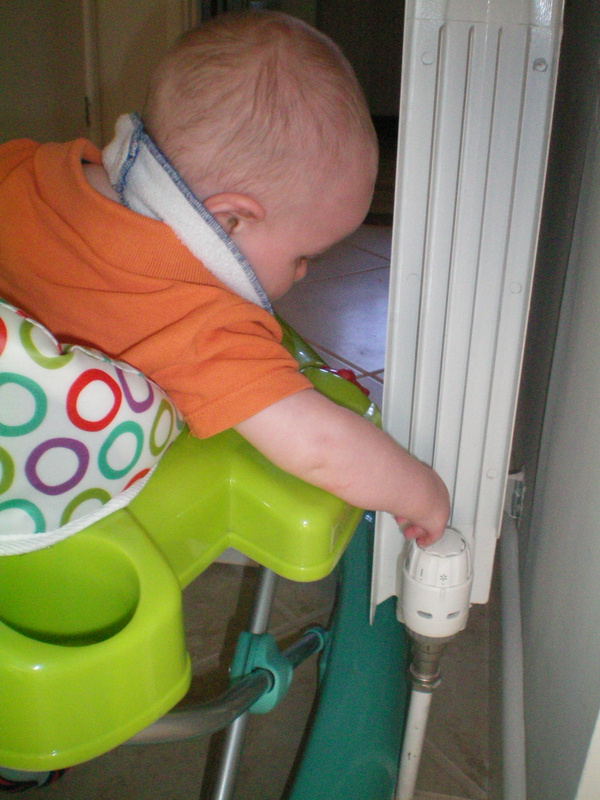 He can now reach hanging toys on bouncy – he couldn’t a few weeks ago. Favourite things today are bubbles and being pushed up hill at Greve de Lecq which was crowded today. Into town today to see about watch. Cost this time is £245 but will take 6 or so weeks. Go for it as shop (near Town Hall – Hettich) says that to buy a new similar one to replace it would be about £2,000 so it is worth it. Apple mac still not in and rain in afternoon so not much for Harry to do outside. BATD club within walking distance of where we are staying – bonus. Take Harry to go to the zoo but big cloud and rain so go to Holme grown instead. Apple ready just a few minutes after I send message that it is not likely to be in before we leave – typical. 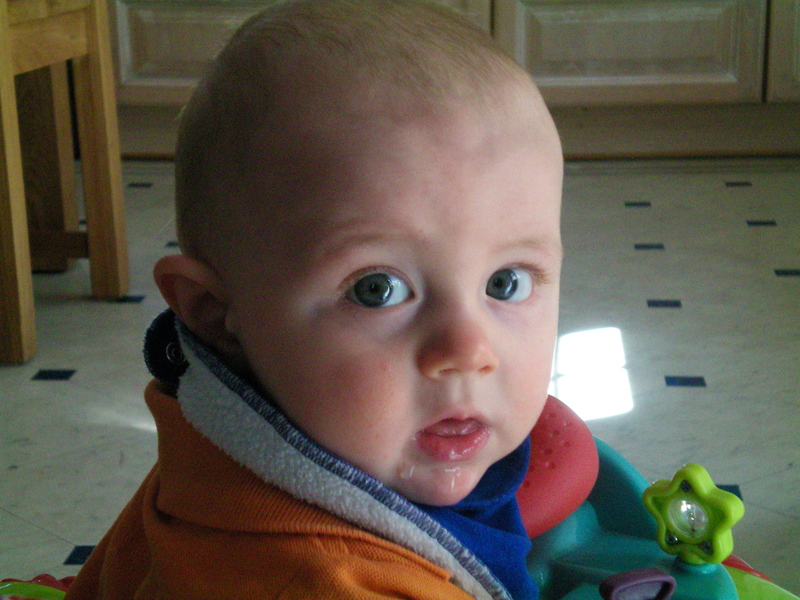 Harry loves his baby walker but thinks it is a bouncer – lovely video of him along with his first interest in plumbing. Our last full day in Jersey, sad to leave Harry, collecting him from nursery at the usual lunchtime. Apple mac in but their Internet not working so can’t pay for it, have to return 30 minutes later. This could have been because of last weekend’s storm so the JEP says. Last visit to Corbiere for this time and one last lovely Indian take-away from the New Raj. Harry not settled for his late sleep so take him for walk in pushchair which finally sends him off to sleep. Lots of “last” cuddles! We won’t see him until mid October. Can’t believe we have been here over 4 weeks and there are so many things we wanted to do but haven’t had time. Early ferry to St Malo and wow it so crowded. The stream of footies arriving from St Malo was never ending and must have gone on for 15 minutes. Lunch in St Malo in a lovely Creperie frequented mainly by locals -a good sign – followed by a walk around the walls which we haven’t done for probably 13 years or so. St Malo seemed to be quite vibrant with only a few empty shops. 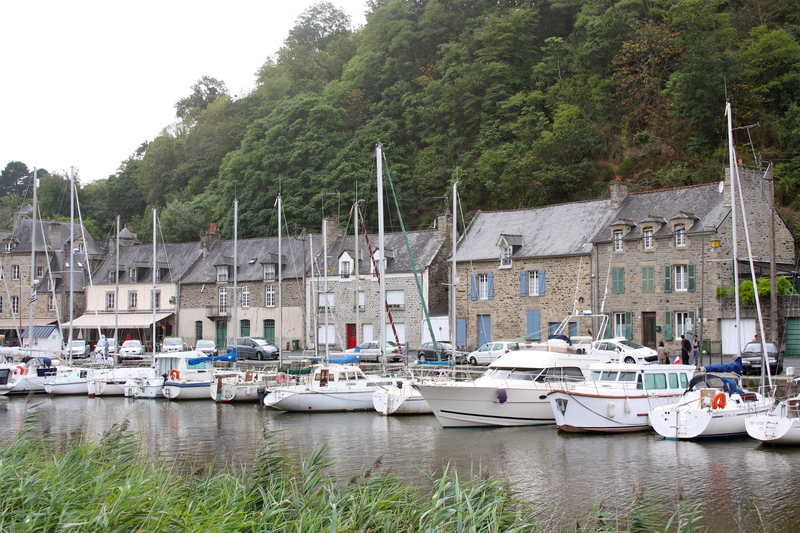 Then off to Dinan to the hotel we used to stay at when we were living in Jersey – Les Alleuz. Visit the old town and the port neither of which have changed much in the 18 or thereabouts years since we visited last. Dinner at Hotel interesting as we were the only ones apart from a coach party of 50 French oap’s being entertained by a local accordion player. They were having a whale of a time, dancing between courses and singing old French songs. Maybe they were on an accordion appreciation tour! Early night tonight as we are both very tired but hotel not as good as we recall it was, it is in need of a good re-furb so net time we may try something else. Only ones in for breakfast with the accordion appreciation society having stolen a march on us and buggered off early. 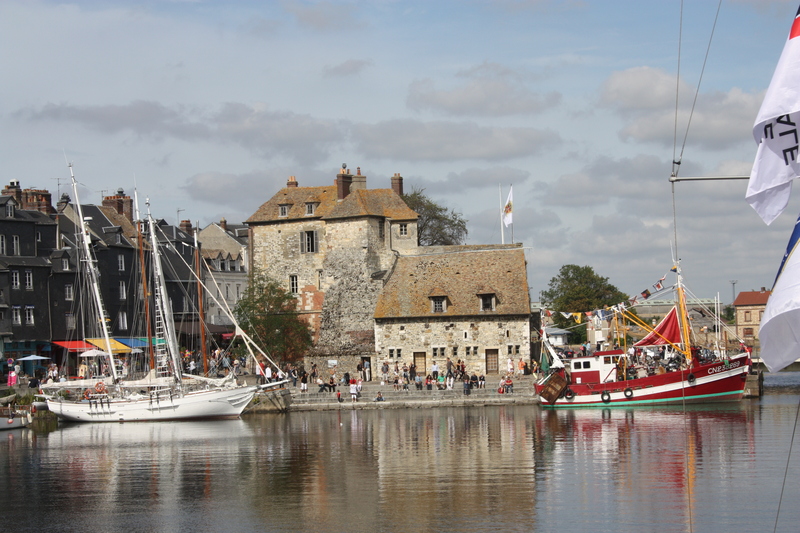 On to Honfleur, a lovely but crowded town somewhat reminiscent of Bergen in Norway. Sally has always had a passion for clothes (what woman hasn’t?) so we thought we would buy this! Church magnificent and people watching is an excellent pastime. A very arti town with many painters working. Followed a McClaren road car back towards hotel – his acceleration was to be admired. Dinner in hotel was a slow process but food good if a bit nouveau cuisine. Wine and other drinks exceptionally expensive but hotel comfort level good. Euro 25 for use of the swimming pool a bit overpriced wouldn’t you say? Breakfast back in Honfleur as cost in hotel (E21 each) too expensive. Then off to buy the wine, coffee and other goodies before our last night ( in Calais) before we return to the Isle of Man. Must stop at a Boulangerie for a bagette as it is the last few hours in France. Both ferry from Calais to Dover and Liverpool to IoM only about a quarter full. Boy are we tired and now have a few days to get ready for our next adventure more about which later.